To cap off a Friday that’s been filled with rumors and roster moves, the New England Patriots have traded for Philadelphia Eagles edge defender Michael Bennett. Per Jeff McLane of the Philadelphia Enquirer, the Eagles are likely to receive a 2020 fifth-round draft pick from the Patriots for Bennett and a 2020 seventh-rounder. The move will likely fill the void that will be left by the departing Trey Flowers, who will now be allowed to test the free agent market. Bennett has been a consistent force as a pass rusher throughout his time in the league. He has accumulated pass-rushing grades of 70.0 or more in six of his 10 professional campaigns and ranked in the top-20 players at his position in five of those seasons, including one fourth-place finish (2014) and one 11th place finish (2015). His latest effort — which earned an overall grade 75.9 — saw him rack up 78 total quarterback pressures, which tied with none other than Trey Flowers and J.J. Watt for the third-most among edge defenders. And this should come as no surprise. Bennett is one of only five players at the position who has tallied at least 40 pressures in each of the last seven seasons, and he has recorded at least two quarterback pressures in 117 of his 146 career games. Since 2014, only Khalil Mack and Von Miller have produced more quarterback pressures than Michael Bennett’s 374. As the New England Patriots to get ready for another season and look towards yet another Super Bowl title, Bennett will now step into Trey Flowers’ place on the Patriots defensive line. However, that’s much easier said than done, as the Patriots used Flowers all over the defensive line last year. Of his 581 pass-rushing snaps, Flowers spent 177 snaps lined up as an interior defensive lineman, which was over 70 more than the next closest edge defender. Flowers used that versatility to his advantage. All told, he won 20.0% of his pass-rushing matchups from the interior and produced pressure on 11.8% of those snaps. If that’s something that the Patriots wish to continue doing, Bennett should fit the mold pretty easily, as he himself has been no slouch from an interior alignment. 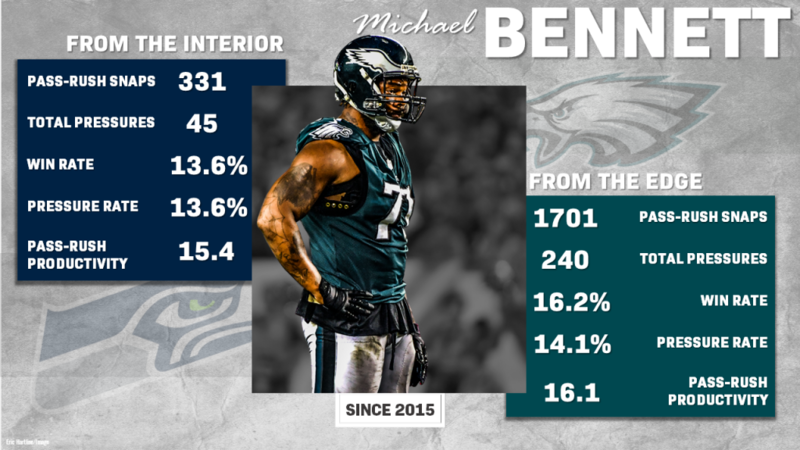 Since 2015, Bennett has produced 45 total pressures from his 331 snaps that came from inside the tackles, while his pass-rush win rate (13.6%), pressure percentage (13.6%), and pass-rushing productivity (15.4) are all very close to his career marks from the edge (16.2%, 14.1% and 16.1, respectively). The move is typical of New England and Bill Belichick. Instead of spending big money on a (relatively) unproven youngster, the team instead has opted to sign a reliable veteran — who produced similar results last year — for a fraction of the price. As we’ve seen time and time again, these moves tend to work out well for the Patriots, so at this stage, who are we to argue?